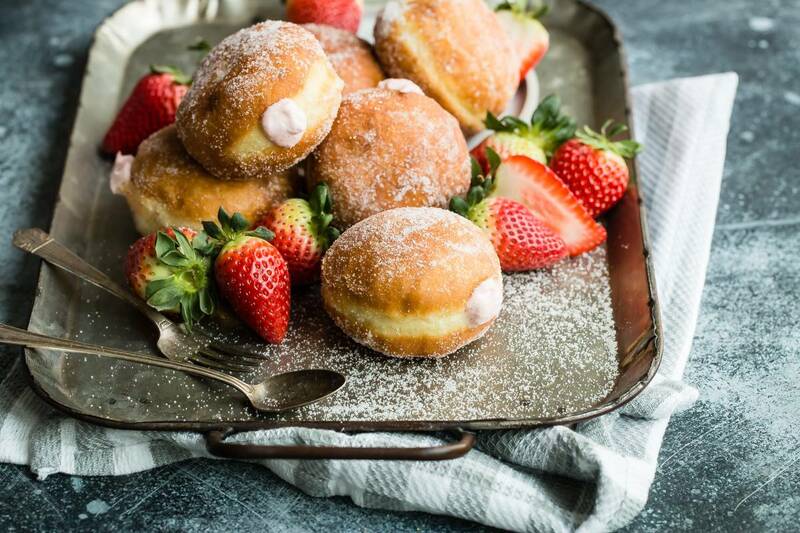 These homemade cream filled donuts are made from scratch and filled with delicious strawberry and cream cheese filling! Is it donuts or doughnuts? 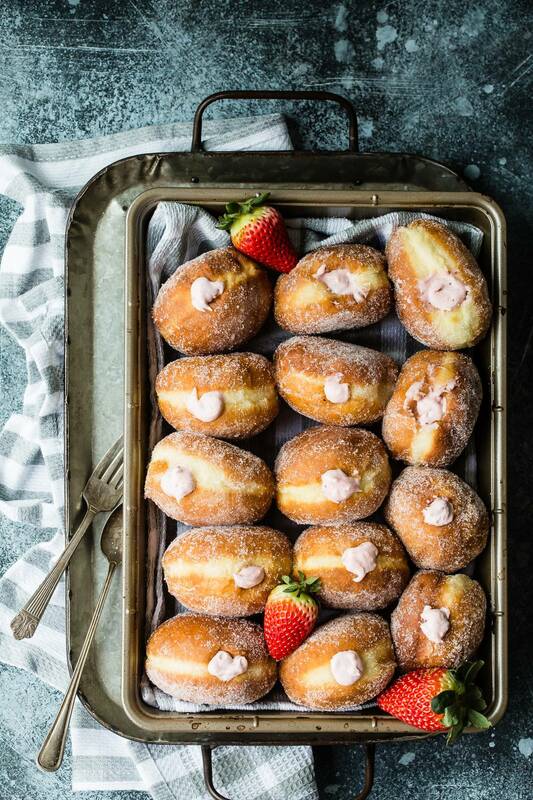 Who cares because when you make these strawberry cream filled donuts, the last thing on your mind is what you want to call them. You just want to dive right in! Strawberries are a huge hit in my house and end up in my kid’s lunch box almost every day. For the record, I’m going with donuts. California strawberries are always fresh and almost every strawberry you see for sale in the country is grown in a California strawberry field by farmers and generations of families who take pride in what they do. With more vitamin C than an orange and high in fiber and antioxidants, you can see why I send my kids to school each day with a strawberry or two, and they just taste amazing! Sometimes in the past, I’ve made baked donuts and they’re still really good but there’s definitely no comparison to a soft, yeast-risen fried donut. 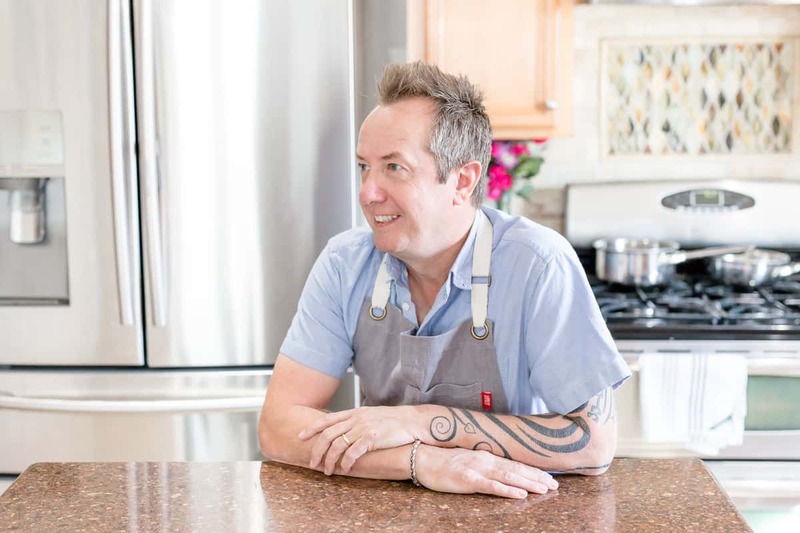 Making donuts at home is actually pretty easy, with time being the only thing you really have to be mindful of. With minimal ingredients and a whole host of fillings you could add, you might end up making a dozen on a slow weekend rather than running to the donut shop! Treat the dough gently and be careful with the hot oil and you should end up with a donut that would rival any large donut chain. What is in the filling for the donuts? 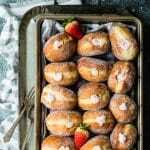 For my cream filled donuts, I combined cream cheese and powdered sugar and then added some fresh strawberries that had been slowly simmered with sugar. Strawberries are naturally sweet but adding a little sugar and a sprinkle of water really helps to draw out the strawberry flavor making the most intense strawberry syrup. 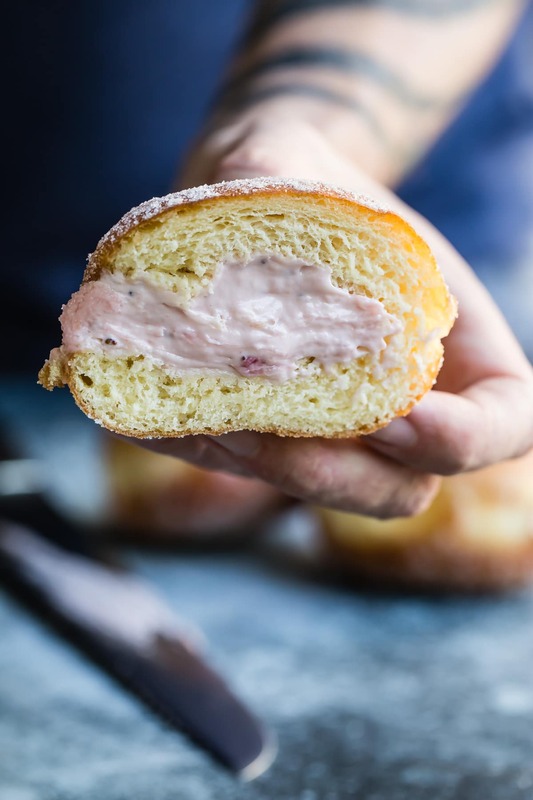 And it’s that strawberry syrup that makes the filling in these donuts so irresistible. Once the donuts have cooled and you’ve given them a good roll in some sugar, you can use any kitchen tool to poke a hole in the side of each donut. Fill a piping bag with the strawberry cream and push the tip into the hole. A quick squeeze and you should have added enough filling. How long will my strawberry donuts last? I recommend keeping them for no longer than two days if they last that long and keeping them covered will maintain their softness. You might also love these other donut recipes! 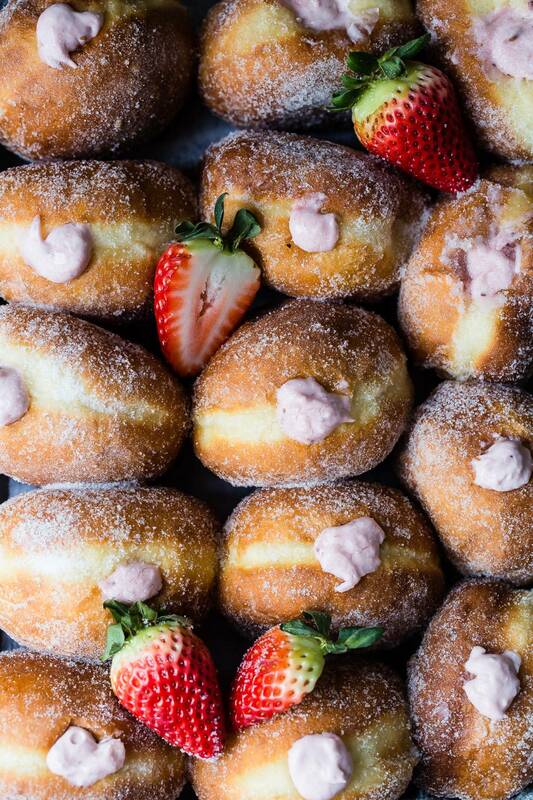 Soft sugary strawberry cream filled donuts! These homemade from scratch donuts are better than any you can buy at the store and they're made with fresh strawberries! In the bowl of a stand mixer with a dough hook, combine the flour, milk, butter, egg yolks, and sugar with the yeast mixture and mix on low speed. Mix until the dough has formed a ball and has come away from the sides. Turn the dough onto your floured work surface and knead into a ball. Transfer the ball to a large bowl lightly brushed with olive oil. Cover with a towel and let rise until doubled in size, about 90 minutes. Punch the dough down and divide it into 14 even pieces. Roll the dough pieces into small round balls and place on a baking tray lined with flour-dusted parchment paper. cover and let rise again for about 30 minutes. Heat the oil until it reaches 375 degrees F.
Place 3-4 donuts into the hot oil and fry on each side for about 1-2 minutes. Transfer the donuts to a plate with paper towel to drain. Once drained, toss in sugar and poke a hole in the side of each donut with a sharp object. In the stand mixer with a beater, combine the cream cheese, powdered sugar and strawberry jam. In a small pan combine the strawberries, sugar, and water until simmering. Simmer for about 10 minutes and let cool. Add a generous 1 cup of the strawberry mixture to the cream cheese cream filling and stir. Fill a piping bag with the cream filling. Push the filling into each donut and squeeze until the center is filled. These are the ulitmate way to say I love you!!! If you need an extra Valentine, I’m available. Lol. These are perfection! I think I’ll move to California just for strawberries and then you can make me donuts, yes? I’m in a serious relationship with donuts—especially these beauties.